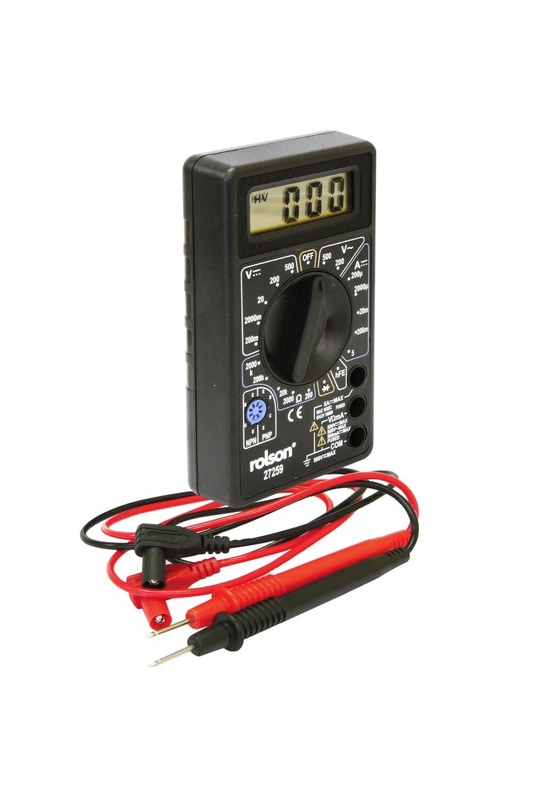 Digital Multi-Meter to measure voltage, current and resistance. It has 7 functions and 19 ranges to cover AC/DC voltage, resistance DC amps battery and diode and signal H2 testing two 575mm (23”) test leads. Tests decible ratios, diodes, transistor and continuity test. Tests decibel ratios, diodes, transistor and continuity tests AC-V: 0-200 -500V. DC-V: 0 – 200MN – 200MV – 20V – 200V – 500V. DC – A: 0 – 200uA – 20mA – 200mA. Resistance: 0 200 – 2000 – 20K – 200K – 2000K.